A fun twist on classic deviled eggs - Western style with diced ham, onion and green peppers and topped with sweet pickled mustard seeds. When I was a kid I couldn't get enough of deviled eggs. I loved making them as much as I loved eating them, so my mom bought me a deviled egg serving platter. It was a fancy white plate with grooves to hold about 16 deviled eggs. Every time we went to a party I'd have to make my eggs to bring. I was only 8 or 9 years old - how cute is that? 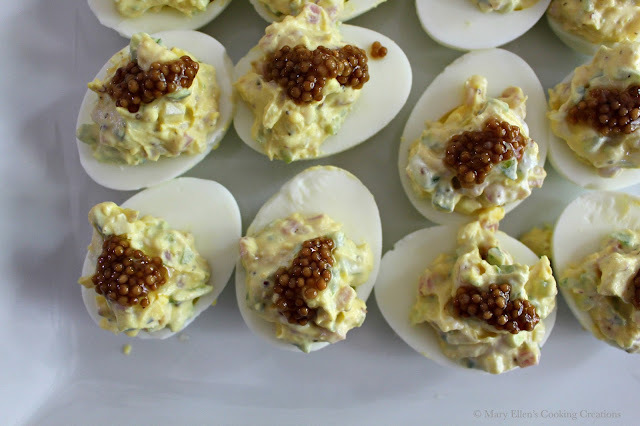 I don't know if I got burnt out on them, but I haven't had deviled eggs in years. 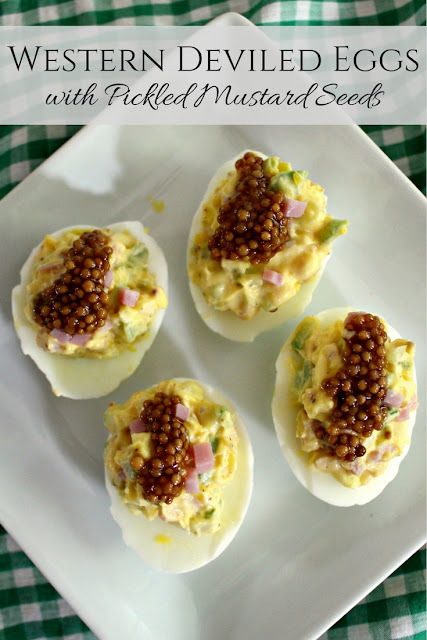 But lately I've been making a lot of hard boiled eggs to have in for a quick breakfast on the go, so last weekend I decided to turn some of them into a fun appetizer for dinner with family. Ham and eggs are such a classic combination, and add in peppers and onions and you have one of the most popular omelette recipes ever - the Western. No need to buy a whole ham, either. Just ask your deli counter for one sliced of cooked ham sliced approximately 1/4 inch thick. 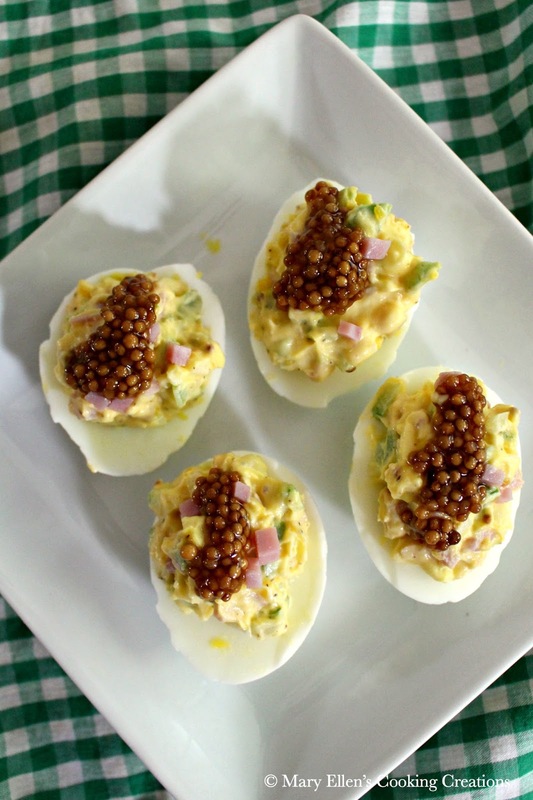 The first step to getting a good deviled egg is to make the perfect hard boiled egg. There are so many tips and tricks out there - boiling, adding vinegar, baking, etc. I keep it simple and my eggs peel perfectly every time and the yolks are bright yellow - no green ring. Place the eggs in a pot and cover with water until they are submerged. Bring the water to a boil for one minute, remove from the heat and cover. Set your timer for 13 minutes and as soon as the 13 minutes are up, run cold water into the pot. I do this for several minutes and even add ice. You really want to shock the eggs so they peel comes off clean. By using this method, that thin skin between the egg and the shell sticks to the shell, not the egg, and makes it super easy to peel the eggs. 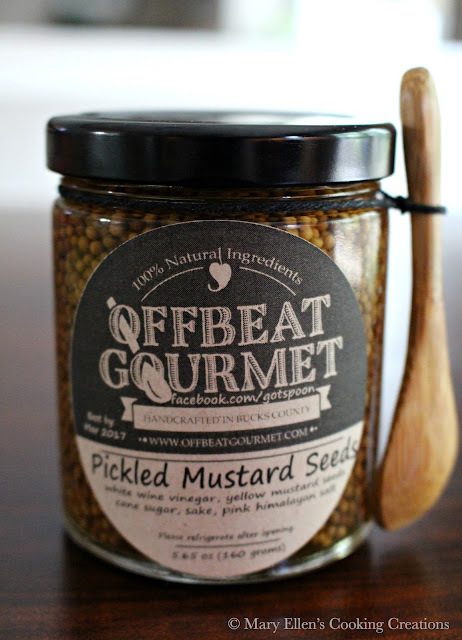 These pickled mustard seeds were a find at a recent cooking demonstration. I had never had them before, but love the texture and the touch of sweetness they add. What a perfect topping for a deviled egg! 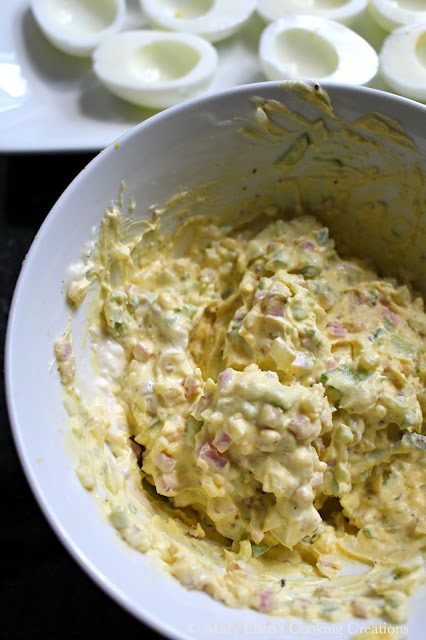 These were so yummy - sweet, creamy, and salty - that I have made them twice in the past 3 days! 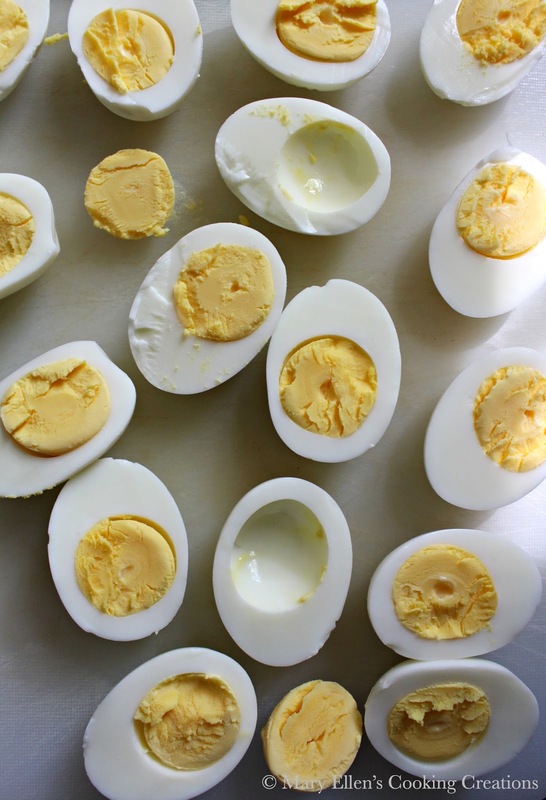 Slice the eggs in half and gently remove the yolk (they should pop right out if cooked properly). In a bowl, mash the yolks using the back of a fork. 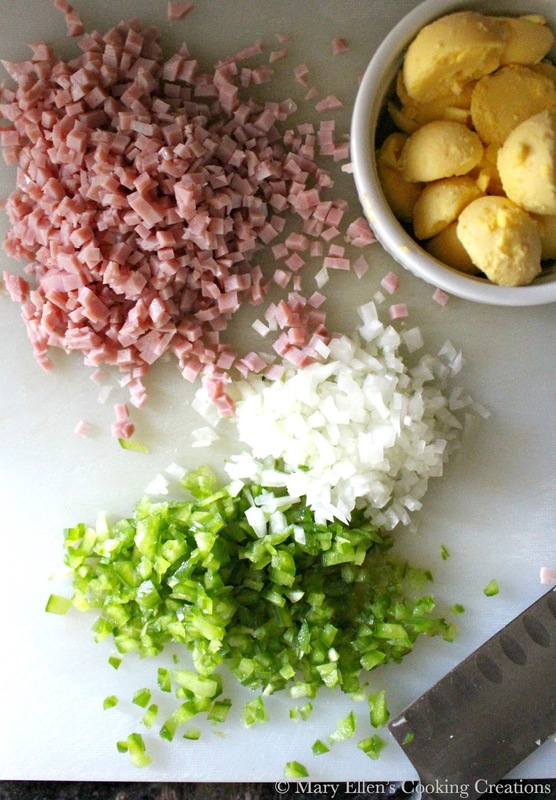 Add the green pepper, onion, ham, salt, pepper, Dijon and mayo. Mix until creamy. Taste and adjust any seasoning. Spoon the mixture evenly between the 16 halves and top with the pickled mustard seeds.